Brackets made from one single grey cast iron section. Plastic pads protect your table. Particularly robust design with wide clamps and easy height adjustment by means of adjusting screws. 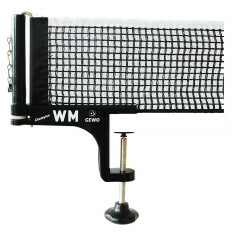 Meets all ITTF requirements. Net: black. Gewo Net WM Champion is beeing added to cart.